On their very best behaviour or their very worst, youll find it all in The Big Book of Babies, a384-page collection of more than 230 Black-and-white photographs printed in duotone that capture the wonder and excitement of babies first years. The expressions of wonder that come from discovering their new surroundings, the incredible messes they can get themselves into, their irresistible habit of falling asleep in the unlikeliest of places these are but a few of the reasons babies entertain, delight and fascinate. 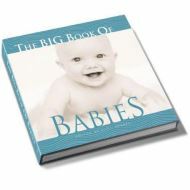 From laughter, to tears, to trouble of all sorts, The Big Book of Babies is sure to bring a smile to the readers face.